I went to Ikea for the first time recently. Yeah I know...where have I been? As a biz, innovation junkie I was in heaven. 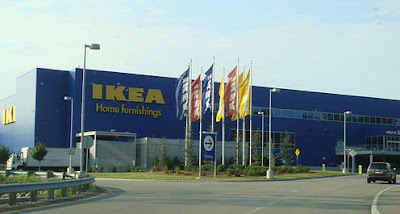 Did you know they are the world's largest furniture manufacturer? Go to a Super Walmart and note that it reeks of sprawl and excess and gross consumerism. 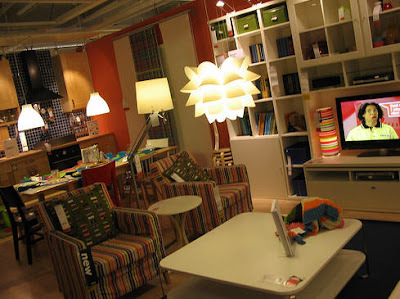 But while Ikea is absolutely huge, it somehow presents as efficient, orderly, rational and oddly, conservation-oriented. I went on a rainy day just after school started. It was MOBBED. It took 30 mins just to get to the parking lot from the entrance road. I felt like I was part of a massive pilgrimage. I was there to get my youngest son a desk, chair and bookshelf for his room. You see, he's now old enough to want to "grow up" his room, substituting Legos and toys for a desk, shelves for his books and music and eventually, an iPod with speakers. The system at Ikea is amazing and a little daunting at first. But once you get it, you've got it. Enter and head up to the showrooms which feature even more than you see in the catalogs you may get at home. Every kind of furniture for every kind of room or office, plus cabinetry, mattresses, sheets/towels/textiles/curtains, kitchen and housewares, children's stuff, storage solutions, lighting, mirrors, decorative items, outdoor stuff...it goes on and on. This is no Walmart. It was set up like a furniture store with everything in rooms and displays. Displaying everything in situ allowed you to pick it up, sit in it and see it all together as it would be in your house. Bigger items (like the desk) you "order" right there in the showroom and they send down to the lower level warehose for it while you finish shopping. Mid-range stuff (like a bookcase) you note down the aisle and bin. Later you will pick it up in the self-serve warehouse. Other stuff (small items like desk mats) you just chuck in the yellow reusable bags you get when you come in. The showroom is on an ongoing pathway that moves like a yellow brick road until at last you're done, wiped out and tired. So, strategically placed, the road leads you right to the cafeteria which is stocked with simple Swedish delights. 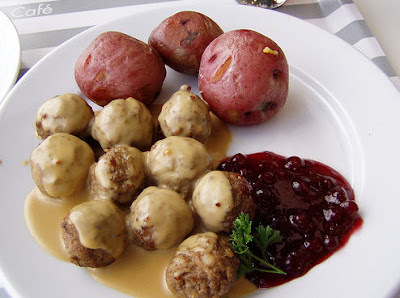 'Natch, I had the Swedish meatballs with gravy and lingonberry sauce (kind of like cranberry sauce but sweeter). It cost $4.99. Free refill soft drink are available for .99 in a GLASS. They do it like good old cafeterias with little waste. You use real glasses, plates and silverware. You put your trays on racks that get washed. Hardly any plastic in sight. Attention to those with little kids - there is a spot there for kids to play and watch movies as long as they want. Oh, did I mention there is a whole area at the beginning where you can drop your kids off to play while you shop? Suitably refreshed, you and your soon-to-be-overflowing cart move on to the odyssey in the lower level. Here is where you can get a big cart and load up on lighting, textiles, decorative and home goods. It's also later where the bigger part of your order comes together. At the giant self-serve warehouse, you get an easy-to-maneuver dolly and pick up your impeccably packaged goods (I got a bookshelf and an office chair). 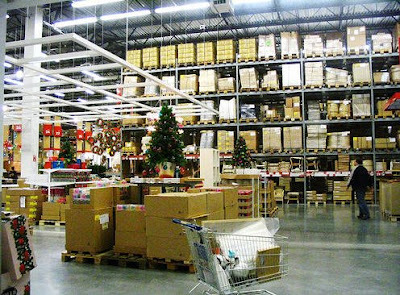 The stuff is actually in the aisle and bins you marked on your list in the showroom. No problem. And the way the stuff is boxed is fascinating and solidly efficient. Everything is optimized to take the least space and to break down to the flattest, easiest-to-ship unit. Very impressive and the least amount of packaging I've ever seen. OK at this point you're thinking, yeah...but it's probably more expensive than Target. And the answer is no and yes - it depends. One thing is the quality is way better than Target. I mean, it's not fine furniture - lots of laminate, but it's well made. Desk ($180), Bookcase ($89.99), Chair (our splurge $169)...and then the incidentals that you can't help but grab along the way - 49 cent kitchen towels, nice sheets for 20.00, a vase for $1.50, a chenille throw for $10.00, 6 glasses for $8.99. You get the idea. What makes it expensive? Your lust for buying too much affordable stuff. Most people suffer this fate at all "discount" mega stores. After you get your warehouse items you go to the cashier. Have you figured out yet that this takes an entire morning or afternoon? You pay for everything and then if you have big items (like the desk), you have to wait for them the area just beyond the vast bank of cashiers. There is also a food mart stocked with Swedish delicacies like frozen crayfish, lots of fishy things, jars of lingonberry sauce, ginger thins and what else? Swedish gummi fish. 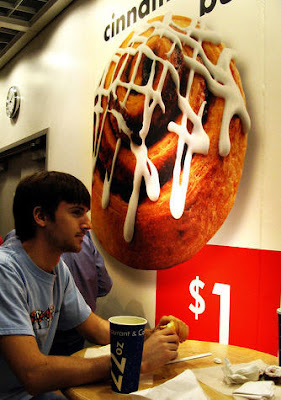 Now, if you're like me, at this point you've given yourself over to the long, wandering, captivating Ikea experience. You've called home and said "eat dinner without me, I'll be here a while." So you're not stressed. And you're at peace with the idea that you have to drive an hour to get home. 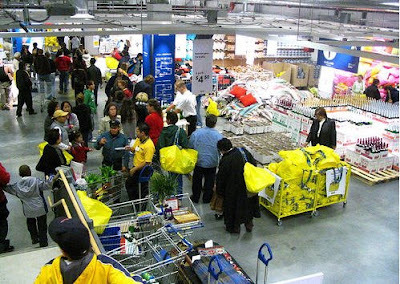 After all, Ikeas are few and far between so there is usually a long haul involved. But hey - life is good...you just got all this nice stuff for a song. Eventually your name is called and you collect your bigger stuff. It's easy to wheel your stuff down to the parking area and load your stuff in your car (OK having the truck/van is a plus). But really, I was amazed at how hassle-free it was. One last observation. I noticed that the place was filled with two kinds of people. Professional, upwardly mobile white people and Europeans and Asians of all kinds who knew Ikea from back in their own countries. So I ask you...why did we not see a wider range of Americans there? Is it because they think they can't afford it? Is it because they don't know about it? This will come as no surprise to people who have done their share of shopping therapy. A new study confirms that "people's spending judgment goes out the window when they're down, especially if they're a bit self-absorbed." Subjects were shown a sad video clip and afterwards they were willing to "pay nearly four times as much money to buy a water bottle than a group that watched an emotionally neutral clip." That must be why I always buy a $50 bottle of wine after I watch a George W. State of the Union address.